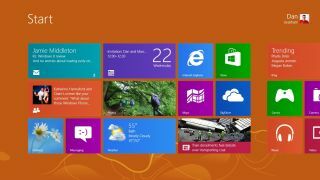 IT departments are in no hurry to make Microsoft's Windows 8 their standard operating system, according to analyst house Forrester Research. In a report on the prospects for Windows 8, Forrester says that early interest in the business world is only half that of Windows 7 and that a handful of factors are working against it. Many IT chiefs don't see Windows 8 as an improvement or a way to save money, they see iOS as the preferred operating system for tablets, and many employees are more interested in iOS and Android devices. Windows 8 received some favourable reviews on its release last year, but reports suggest that the radical change from earlier systems has turned off a lot of potential buyers. In April analyst firm IDC said disappointment with the operating system had contributed to a worldwide slump in PC sales. Forrester says that if Windows 8 is to become the standard for business it should be used on about half of company issued PCs by the time the next version of Windows hits the shelves – as did Windows 7 – but it doesn't believe that will happen. In addition, Forrester says that most companies still using Windows XP are looking to move to Windows 7 before support for the older system is withdrawn in April 2014. But there is a bright spot in the firm's Forrsights Workforce Employee Survey for the fourth quarter of 2012, which shows that 38% would prefer to use Windows 8 on their work computers over 37% for Windows 7. This suggests that companies should make provision for supporting Windows 8 even if it is not their standard. Microsoft is reported to be planning updates to Windows 8 before the end of the year.